So the big news today seemed to be this. Netflix and Nintendo have come up with a solution that will allow you to stream Netflix streaming movies and shows to your Wii Game console. It will work much like the PS3 streaming and requires that you obtain a disk from Netflix (you have to be a Netflix member to do this) before your Wii game machine can handle the streaming. 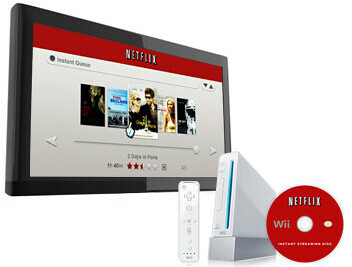 You can get your Wii in the line by heading to this Netflix page. This is to order the disk which won’t be available until sometime this Spring. Why does this matter? Well for many who already have this capability with their PS3, XBox360 or one of the multitudes of Blu-ray and streaming devices it won’t. But remember that there are a ton of folks out there with nothing more than a Wii machine connected to their TV. So ultimately this expands Netflix’s reach to more households and give Nintendo a feature to add to their sales pitch. So despite the fact that I have multiple ways to access Netflix Watch Now movies and shows already thanks to my Blu-ray player, SageTV, laptops etc etc, I still ordered one for the Wii. Hey, it’s free so why not.